Powers/Abilities: Zannarth is an incubus: he consumes the souls of females to survive. He also possesses some degree of superhuman strength, and likely had resistance to conventional injury, aging, disease, etc. (Haunt of Horror#2/8 (fb) - BTS) - The demon Zannarth was forced to become Satana's companion and slave. One time she jokingly stole his soul, after which Zannarth began to resent her. (Haunt of Horror#2 (fb) - BTS) - Satana and Zannarth were banished from their Hellish realm, apparently by the Four. Zannarth was sent to a Netherworld and Satana was sent to Earth. (Haunt of Horror#2/8) - When Satana traveled to the Netherworld in hopes of finding an alternate passageway to Hell, Zannarth ambushed her. However, as they struggled, she kissed him, and he pulled away as she threatened to drain his soul. She convinced him to join her on her quest, and saved him from a Nightbeast that attacked him. The two easily fought off another band of demons sent against them by the Four. (Haunt of Horror#4) - Satana and Zannarth continued their journey until they were confronted by the Four. Zannarth tackled and pummeled Raga, but was then bitten and slain by the poison of Ellin. Comments: Created by Gerry Conway and Romero. 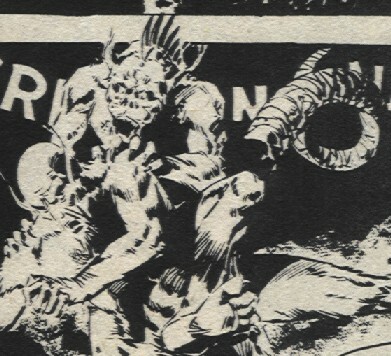 In Haunt of Horror#5, Miles Gorney taunted Satana with the spirits of her friends and allies, including Zannarth, but Satana claimed that these were mere creations and not the true beings. Given the fact that Gorney was actually just a guise of Satan, and that Zannarth was slain by one of his agents, it's pretty likely that Zannarth would have been sent to Hell after being killed by Ellin, which is what he wanted, anyway. Another demon of Hell, it attacked Zannarth under direction of the Four, but was enslaved by Satana's will. It was presumably slain (or escaped) in the next demon attack, as it was not seen again afterwards.